The minimalistic box contains the keyboard, mouse, a wireless usb dongle, a usb charging cable and an instruction manual. 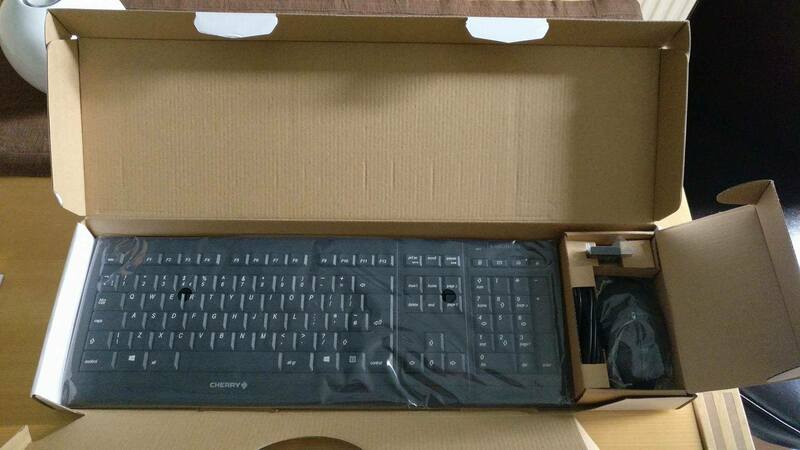 Both mouse and keyboard are fully charged at unboxing time, and are ready to use right away. Both mouse and keyboard have a slick, minimalistic and stylish design, especially the countours of the mouse feel very sharply edged. The set fits very well together and has a specific "office, professionalism" look and feel. Also in build quality does the Cherry B.Unlimited not disappoint: the keys on the keyboard are durable and barely make any sound while typing. The mouse feels incredibly sturdy and the form factor implies it's intended for palm-grip users. The only big thing missing are navigation buttons on the side of the mouse. I tested the desktop set with both my Windows desktop and my laptop running Arch Linux. As expected, the product ran smoothly under Windows, and even on Linux there was only one minor issue with the keyboard, in that not all of the multimedia keys functioned properly out of the box. More specifically did the screenlock button and the homepage button function well, but the e-mail and calculator buttons didn't. This desktop set is clearly intended to be used in an office setting, and for its purpose it seems to be doing its job very well. A first concern I had was the rather large USB receiver that has to be plugged into the pc. If it is used on the rear panel of a desktop it doesn't matter all that much but on the side of a laptop, it does take quite some space. It isn't particularly intrusive but it is an extra +- 3cm of width that could have been avoided. I personally would have enjoyed seeing a slightly higher resolution on the mouse, but I am notorious for using my mouse on the highest possible DPI setting, so for most office users, this mouse will probably do just fine. Navigation buttons on the side of the mouse would have also been a welcome addition as office work may require quite a lot of browsing programs or websites. Aside from those minor issues, this product served me very well during the testing period and I must say it's a joy to type on the keyboard: the keys actuate very smoothly and accurately, while barely making any sound at all. As an added bonus, the signal of both keyboard and mouse are AES encrypted so that there is no interception possible of typed keys. This product feels very durable and is great to use on a daily basis, which is why I could certainly recommend using it as a daily driver for work or study. Overall, the B.Unlimited 3 Desktop set is a very high quality product from a manufacturer known to deliver on their promises. Aside from a few design flaws, such as the lack of navigation buttons on the side of the mouse, this product is a great option for companies that want to provide their office workers with a simple, yet highly functional peripheral set that just works the way it needs to. The Cherry B.Unlimited 3 can be yours at a recommended retail price of 85 EUR. For its high-end build quality and attention to detail, such as the AES encryption on the signal and the laser-engraved keycaps, this desktop set receives the BlackHoleTec Gold Award.